The ASML 5000 will rely on a number of evolutionary improvements over the 3400 series, which customers such as Intel, Samsung, and TSMC are using now. The most noticeable will be an increase in the machine’s numerical aperture from today’s 0.33 to 0.55, Yen told engineers at the IEEE International Electron Device Meeting this week in San Francisco. Numerical aperture is a dimensionless quantity related to how tightly light can be focused. A higher numerical aperture means better resolution. Changing the numerical aperture in the EUV machine will require a larger, more perfectly-polished set of imaging mirrors. 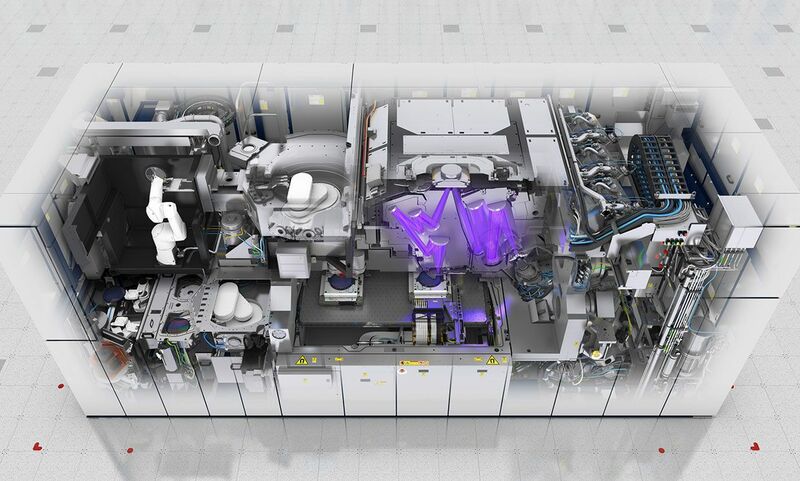 A next generation machine will need even more EUV wattage. In the lab, ASML has cracked 410 W, though not yet at duty cycle good enough for chip production. More powerful lasers will help, and so might increasing the rate at which the tin droplets are zapped. In today’s machines, the tin drops are shot out 50,000 times per second, but Yen showed that the droplet generator could run at 80,000 Hertz. In the meantime, the company is improving the capabilities of its 3400 series. A new version, the 3400C will be released in the second half of 2019 and surpass 170 wafers per hour. One sore spot in its development had to do with the extremely expensive masks that hold the pattern to be cast onto the silicon. The coverings, called pellicles, which are meant to protect the masks from stray particles, absorbed too much light. ASML says existing pellicles transmit 83 percent of light. This reduces throughput to 116 wafers per hour. The goal is to improve transmission to 90 percent, says Yen. But ASML is also working to keep the inside of the machine even cleaner than it does now, so that customers can feel free to use masks without a pellicle.